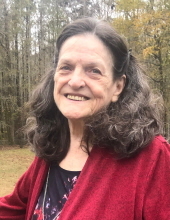 Nancy Jean Lewis, age 76, of Jefferson, Georgia, passed away on Tuesday, April 2, 2019. A memorial service will be held on Saturday, April 13, 2019, at 5:00 pm at Crowell Brothers Funeral Homes & Crematory Buford Chapel. Nancy is preceded in death by her parents Ralph and Rosa (Gwaltney) Cook. She will be greatly missed by her daughters Jana Hamrick (Mark), Bambi Douglas, Penny Flynn; brother Curt Cook; sisters Wilma Cook and Rose Vance; five grandchildren; five great-grandchildren; and one great-great-grandchild. On-line condolences may be expressed at www.crowellbrothers.com. Arrangements entrusted to Crowell Brothers Funeral Homes & Crematory, 201 Morningside Drive, Buford, Georgia 30518. 770-945-9999. To send flowers or a remembrance gift to the family of Nancy Jean Lewis, please visit our Tribute Store. "Email Address" would like to share the life celebration of Nancy Jean Lewis. Click on the "link" to go to share a favorite memory or leave a condolence message for the family.